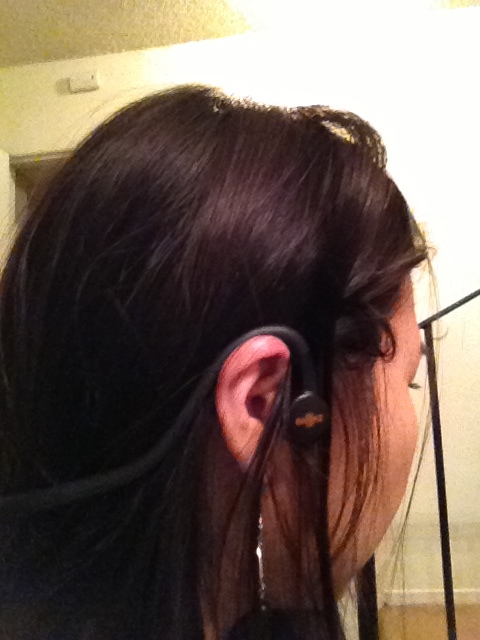 I was﻿ sent these headphones to review, which are different in that they don't actually go inside your ear. From their representative: "Instead of traditional headphones that cover the ears and earbuds that nest inside ear canals, AfterShokz’s ultra lightweight and durable wraparound headband stays securely in place during rigorous sweat sessions and is equipped with transducers that rest outside the ears to send sound via little vibrations that travel from the cheekbones to the inner ears (bypassing the eardrums completely). An in-line control box offers complete functionality so users can keep mobile devices safely tucked away during activity—power the unit on/off, adjust volume levels, play/pause/advance music and make/take phone calls seamlessly." Here's what they look like, nestled under my unkempt hair. The unit stays on because it wraps around the back of your head and hooks atop your ears. I haven't had any problems with this, and it even has a mic! The packaging... it comes with a case! This is definitely not for train commutes, though... I like plugging my ears up from any and all sounds on there (although I probably shouldn't!). How was the sound quality? I would think there would be a lot of "noise" not plugging into your ears. I am intrigued though! I have seen them for swimming but it was several years ago and they went across your cheekbones. I figured it was a fad.